This week’s giveaway is for a family four pack of tickets to the Hylton Family Series presentation of Peter Rabbit Tales taking place November 1st at 2pm or 4pm. To enter, find the matching image of Peter Rabbit Tales on our Facebook fan page and leave a message identifying whether you like Flopsy, Mopsy, Cotton Tail, or Peter the best 🙂 Good luck! The magical and marvelous world of Beatrix Potter comes alive at the Hylton Center when Peter Rabbit and his cousin, Benjamin Bunny, go on one final escapade in Mr. McGregor’s garden. All of Potter’s popular characters are along for the ride, from Squirrel Nutkin to Mrs. Tiggy-Winkle, and Jemima Puddleduck to Thomasina Tittlemouse. 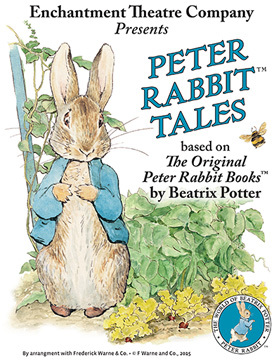 With this delightful performance, Peter Rabbit and friends celebrate the 150th anniversary of the birth of this beloved British children’s author. The adventures and misadventures of these cherished characters have enchanted young readers for well over a century, when the precocious young rabbit first hopped out of the pages of a storybook and into children’s hearts. The Enchantment Theatre Company brings this captivating performance for children filled with fantastic masks, whimsical puppets, gorgeous scenery, and original music. As always, when you enter one of our giveaways you agree to be bound by our giveaway rules.